Last weekend, some friends and I got together for an early Thanksgiving dinner. 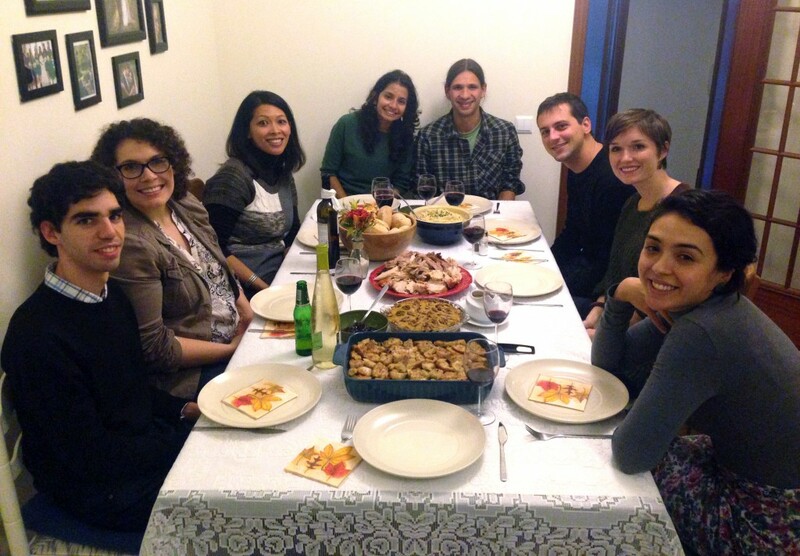 Five Americans, three Brazilians and one Portuguese, all around a table piled high with traditional American dishes! It was the very first Thanksgiving for some, but for those of us who grow up celebrating the holiday every year, it felt just like home. Let me just say, though, that Thanksgiving dinner is a lot more complicated when you live in a country that doesn’t celebrate Thanksgiving! It can be difficult to find even the most basic ingredients, and since you aren’t given any time off work, pulling off a huge dinner can be a headache. There are certain tricks I’ve learned to make things a little easier, and I’ve collected a few more from the internet. Hopefully these will help make your expat Thanksgiving just perfect. Here are some of the most difficult ingredients to find, and some tricks I’ve learned over the last few years. Since whole roasted turkey is not a traditional holiday meal in many countries, it might be difficult to find. If you can’t find a whole turkey at the supermarket, try asking your local butcher if he can order one for you. Go in about a week in advance, just to be safe, but many butchers only require two days’ notice. You can also consider alternatives, like roasting just a turkey breast, or making roasted chicken or ham instead. Fresh cranberries are just not available in Portugal, and I think the same goes for the rest of Europe. However, several health food stores carry dried cranberries, which can be used to make a fabulous cranberry sauce in a pinch. They’re a little expensive, but you don’t need that much cranberry sauce, do you? 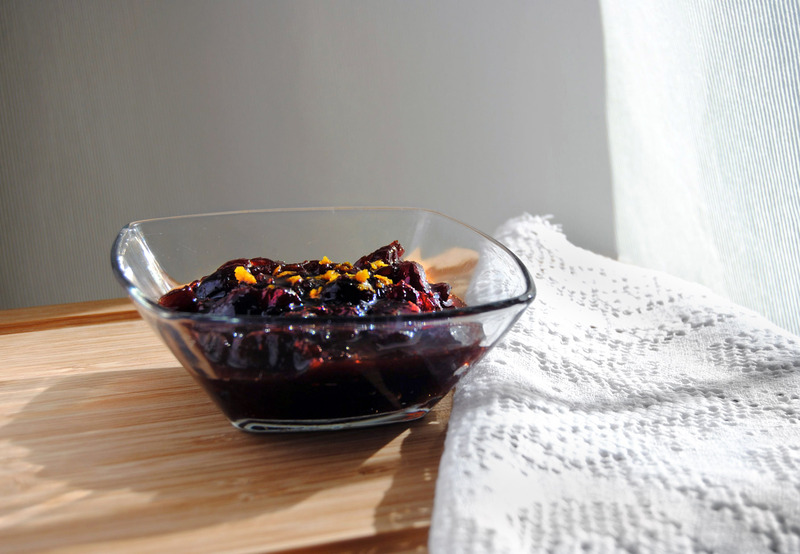 Combine one cup of dried cranberries with 1 1/2 cups of cranberry juice (unsweetened) or water in a small sauce pan. Add 1/4 cup brown sugar, a cinnamon stick, the zest of one orange, a pinch of allspice (or any other seasonings you feel like adding) and bring to a simmer. The cranberries should plump up and absorb much of the water. Add 2 tablespoons of cornstarch to around 4 tablespoons of warm water, stir to combine and add it to the cranberry sauce. Continue to simmer until the sauce thickens. Pumpkin pie is not a thing in Europe. It’s just not. I just skip the pumpkin pie and make an apple pie instead, but you can find recipes here, here and here for homemade pumpkin pie. You could also consider trying a sweet potato pie, instead. Hunting for brown sugar gave me such a headache for my first several months in Portugal, as nobody seemed to understand that I wasn’t just asking for “sugar that is brown”, also known as unrefined cane sugar. 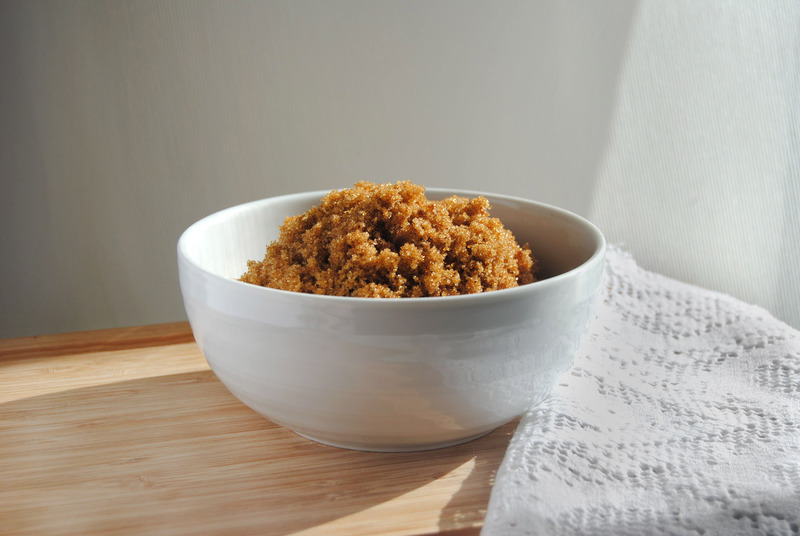 It was such a relief when I discovered that I could easily make my own brown sugar at home. To make light brown sugar, just add a tablespoon of molasses to a cup of white sugar and mix well with a fork. For dark brown sugar, use two tablespoons of molasses for every cup of sugar. These are so hard to find in so many places. International shops may carry them, but they’ll be a bit overpriced. Try speciality candy shops as well. If you’re incredibly ambitious, here is a recipe for homemade marshmallows, but remember that sweet potato casserole tastes delicious with a pecan topping. There are plenty of other resources out there to help you make your international Thanksgiving perfect! Joy the Baker has an amazing recipe for butter-only pie crust, which is the one I used this year. It was delicious! I prefer butter but for those of you who normally use shortening, it can be hard to find abroad. Here’s a simple tutorial for making a woven lattice pie crust, but if you’re feeling extra fancy, why not try a gorgeous decorative crust? If you’re lacking some key ingredients for your normal Thanksgiving dishes, here are 50 side dishes that you might consider trying. I bet you can find the ingredients for at least a few of these. So if you’re celebrating away from home this year, good luck and Happy Thanksgiving! I’ll leave you with my favorite apple pie recipe. It’s rustic, simple, and delicious. This is my favorite apple pie recipe, and it's so simple to make! Basically you make a buttery, brown sugary caramel sauce and pour it over the apples AND the crust. Yum yum yum. The apples cook perfectly and the crust is absolutely divine because the buttery, brown sugary caramel sauce cooks up nice and golden and crunchy. It's perfect. Use your favorite pie crust recipe (mine is by Joy the Baker - I've included the link above) or use a storebought one, if you must. Melt butter in a small saucepan. Add flour and stir to form a thick paste. Add sugar, brown sugar and water. Bring to a boil. Reduce heat, add spices, vanilla and salt and simmer for 5 minutes. In a medium bowl, mix apples and half of the sugar/butter mixture. 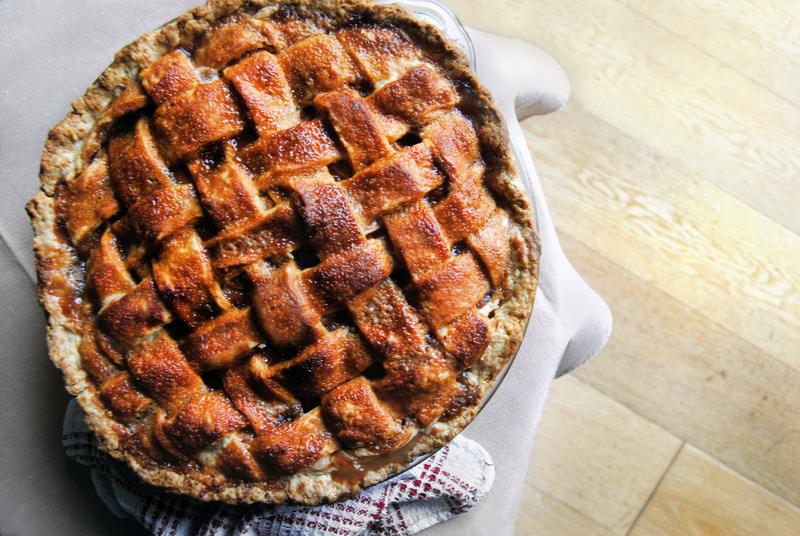 Place bottom crust in a 9-inch pie pan and fill with apples – they should be mounded slightly. Cover with a lattice crust (leaving some small spaces between the pastry). Pour the remaining sugar and butter mixture over the crust, using a brush to ensure that the whole crust is covered and that any excess doesn’t run off the edge of the pan. Bake for 15 minutes and then reduce the oven temperature to 350ºF/175ºC. Continue baking for 35-45 minutes or until the crust is golden brown and the filling is bubbly. Wish I could be there to cook another perfect turkey for you! Still can’t believe that the TSA seized my cranberries! !